We later decided that we will set a goal of 21 knitted items, as Patrick O’Brian wrote 21 books in the Aubrey/Maturin Canon. Should we quickly meet this goal, we could do further volleys, as it were. With a “firepower” of 21 items per volley, we are a force to be reckoned with! You are welcome to join us, just drop a note via the Comments or the Gunroom. 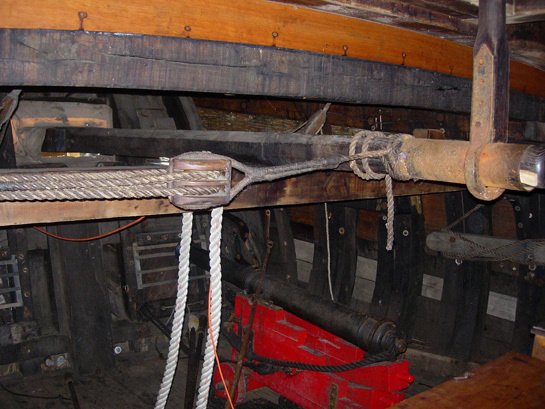 The Mayflower II is conned from the main deck with orders shouted down through a hatch (first photo, above) to the helmsman at the whipstick (right) a deck below. Here he also has a compass (not pictured) and traverse board (left), plus he’s afforded a view of the sails through the hatch. Moving the stick moves the tiller, a deck beneath (photo below), which in turn moves the rudder. These photos can be enlarged by clicking on them. 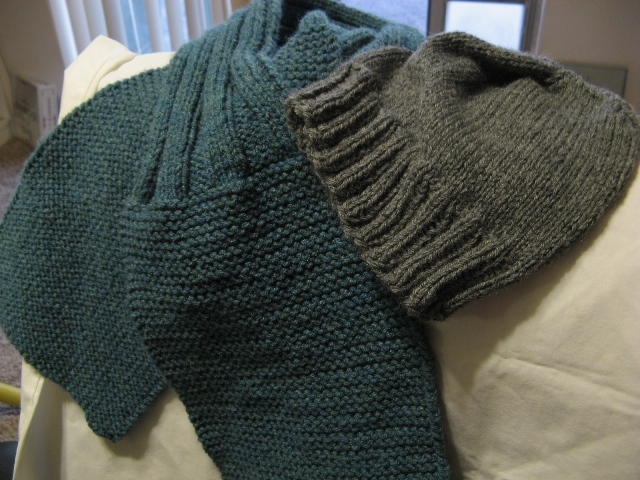 October, 2010 — Catherine colleced all our haul of knitted items and shipped them to the SCI. This year we completed a neat 50 items — 43 hats and 7 scarves. Here they all are, guarded by Lerwick, the Hebridean sheep. 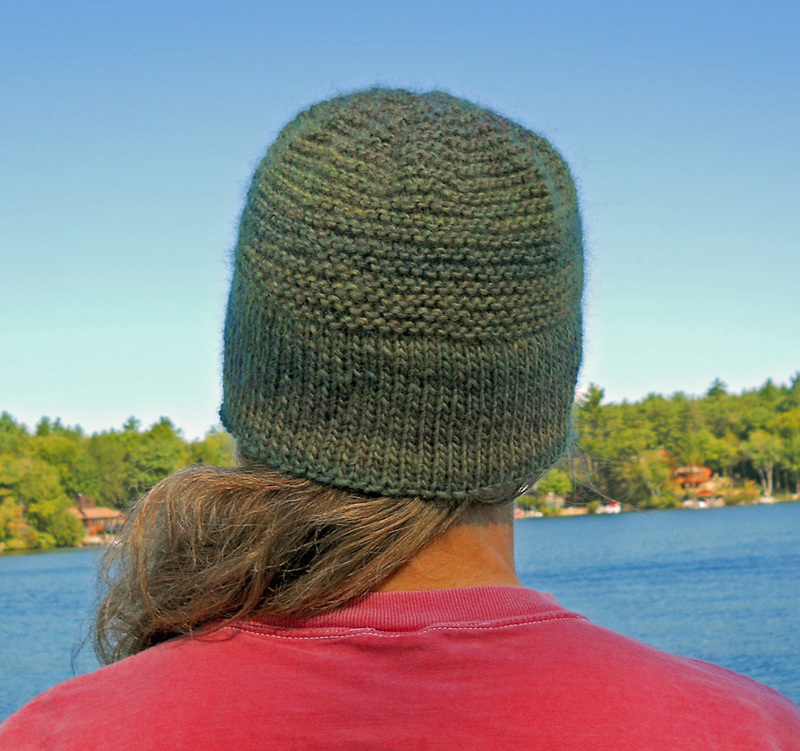 September, 2010 — Linda knitted a Seafarer’s Beanie. Lois tried the snappy new scarf pattern with lengthwise stripes, and Gus finds it very dashing. The rest of us have been busy, too. More pictures to follow! October 25, 2009 — Katherine assembled all our work before taking it down to the SCI donations room. Here it is all guarded by Lerwick the Shetland sheep. Total for this year, 57 items, or 58 if you count the socks separately! October 2, 2009 — Astrid made a balaclava (also called a Knitted Helmet) and a Marsan Watchcap. Katherine is gathering up all our knitted items and will deliver them to the SCI later this month. May 30, 2009 — Lee Ann made four Oliver’s Caps, a simple watchcap design by Jeanette DeVita, the Program Manager for Christmas at Sea. Katherine took in our accumulated scarves and caps, a total of 64 items! 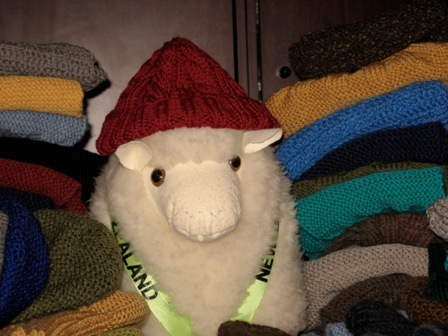 Prior to delivery, they were watched over by Wellington, the New Zealand sheep. And here’s a close-up of Wellington — note the air of fierce concentration. 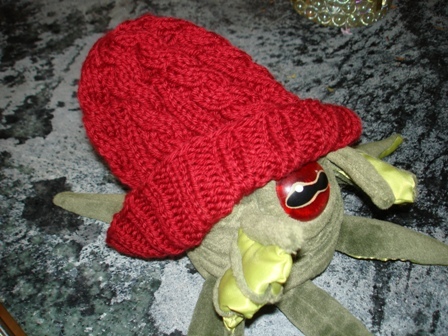 Astrid finished a modified Watch Cap, but Montezuma thinks it’s a bit big for him. 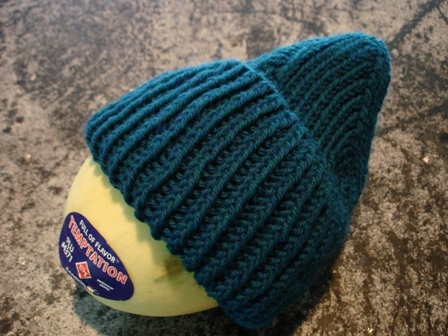 Astrid finished a Marsan Watchcap, and the Temptation Melon finds it cozy. 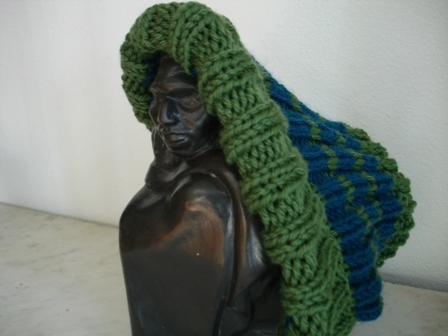 Astrid finished the Lucky 7 Hat, and Nyarlethotep found it just the thing to wear on a chilly Arkham night. 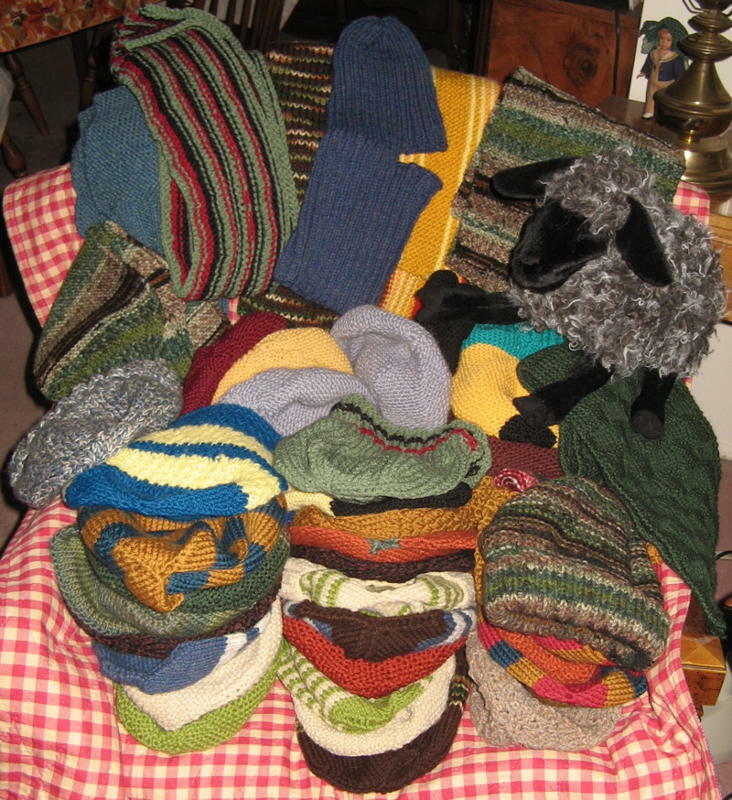 The SCI had a spring hat drive, Knit 4 Lent, with the goal of collecting 4000 hats knitted during the 40 days of Lent. The Whipstickers stepped up to the plate and made 26 hats, here kept in line by Rhodri, the Welsh Mountain sheep. Katherine delivered them, and saw tables filled with hats in the sorting room, as well as boxes still to be unpacked. Here’s hoping they made their goal! Linda is first past the post this year, at least as far as pictures go. I hear rumors about hats, but pictures are the proof of the pudding. Linda ran out of yarn and brainstormed with the other Whipstickers for solutions, finally going with the most labor intensive, which involved ripping out work on one end and reknitting it in red yarn, so it would match the other end. It makes for a very dashing effect. And is that a deck prism in the middle of that elegant display? Catalina and one of the Gunroom stalwarts, Hugh, delivered our hats and scarves to the SCI. Hugh is holding up a copy of HMS Surprise, the book that got all this started, being the first of the Aubrey/Maturin series that brought us all together. Did all those things come out of that wee white seabag? Notice Catalina’s hands. Could she be . . .? . . .why yes, she is knitting up the very last scarf, having discovered a dropped stitch in one of them the day before that required ripping back eight inches. Also notice her sweater, which I’ll bet she knitted, too. Here’s the yarn room at the SCI, with Jeanette, the director of the knitting program on the left, and a volunteer on the right, getting ready to open the day’s packages of donations. This is their busy time, as warm knitted items pour in from around the country to be packaged into bundles that are distributed in December. There are bins of yarn on the right, which the SCI will send to knitters for a modest fee. Beyond that are bins stuffed with knitted goodness, part of this year’s donations. The SCI’s goal for 2007 is 16,000 items, of which they’ve received about 46% — but things will come in thick and fast now. We have a total of 44 items! That’s two volleys of 21 each with 2 leftover. Great job, Whipstickers! Oh, we’ve been busy, just not blogging. Linda was concerned about the colors of this Watchcap, but not only can real men wear bright colors, there are merchant seawomen as well. Astrid finished this Seamen’s Scarf, and the tree is grateful. We have now completed a total of 30 items, with another 6 on the needles. We’ve also pressed found three new recruits, Betsy, Shoshona, and Katherine. Welcome! Astrid has completed her first Watch Cap. The ruffed lemur thought it was a good place for a nap. Catalina has been busy indeed! It looks to me like 6 Watchcaps, 1 Balaclava, and a Seafarer’s Scarf. Catalina has been spending so much time knitting that she hasn’t had time to send a photograph. 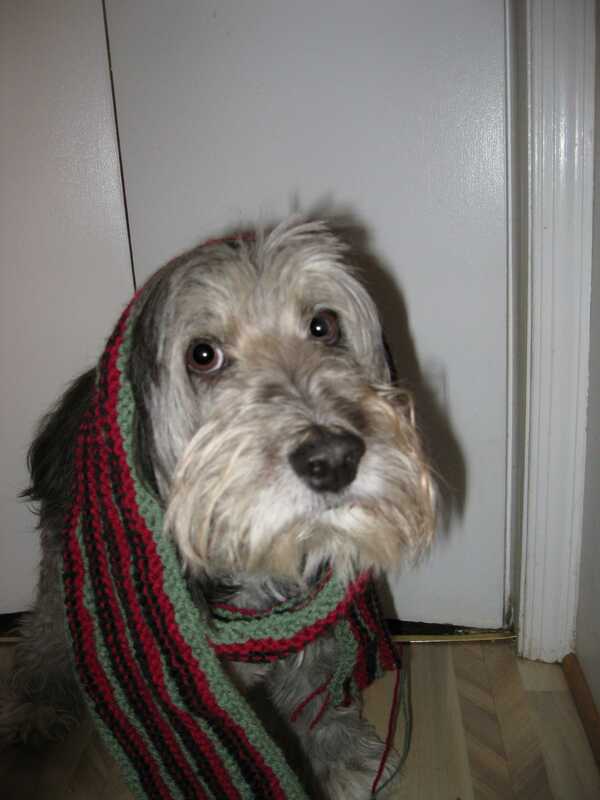 Augusta, who also answers to Gus, although she is every inch a lady, is wearing the Seafarer’s Scarf that Lois knitted. Yes, Gus, you can have your bone now. 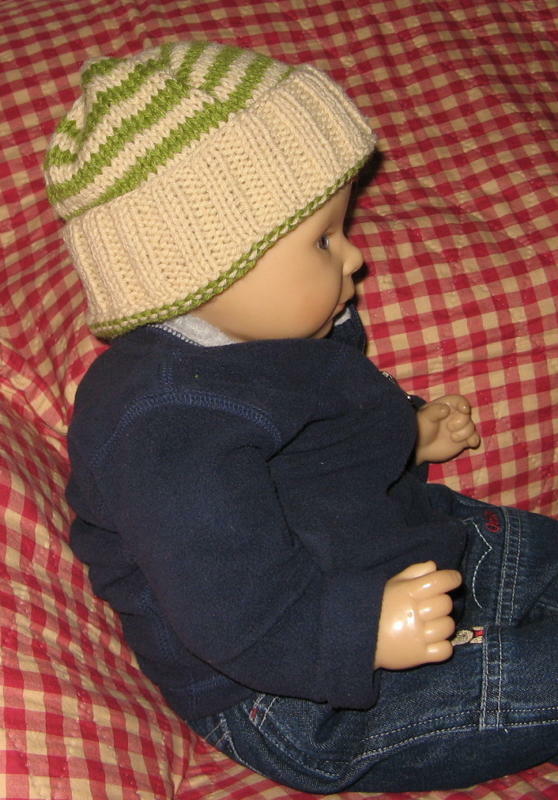 Linda’s son is modeling the Knitted Helmet, which, in our history geek way, some of us call a Balaclava. Now Linda’s son looks every inch the well-turned out Ship’s Boy in the Watch Cap. Astrid made the Mariner’s Scarf, and her rowboat couldn’t be happier. Little does the boat know that the scarf will be given away. Which I’ve been knitting for ’em on my own already – Sign me up for the Whipstick crew, cap’n! Excellent! Send me photos (reduced size, please) and I’ll post ’em. You are definitely a plank holder, since it was your idea. Will you have another knitter? And what fiber are we using? Wool, I hope–surely not acrylic for all love! Superwash or regular old? ah–I see the guidelines at the main site. As it happens, I DO have some Homespun (the brand, not my own handspun–yes, acrylic 😉 ) that needs a home, so perhaps that’ll do for a scarf. It’s in masculine colors at the least! Welcome, Lynn! Yes, we’d love to have you join us. I’m glad you found the guidelines — SCI is exceedingly picky, isn’t it? Thanks for stopping by, Janet! If you want to join a merry mob discussing the Patrick O’Brian books, you might want to consider signing up for the Gunroom, at http://www.hmssurprise.org/ . Sign me up too! 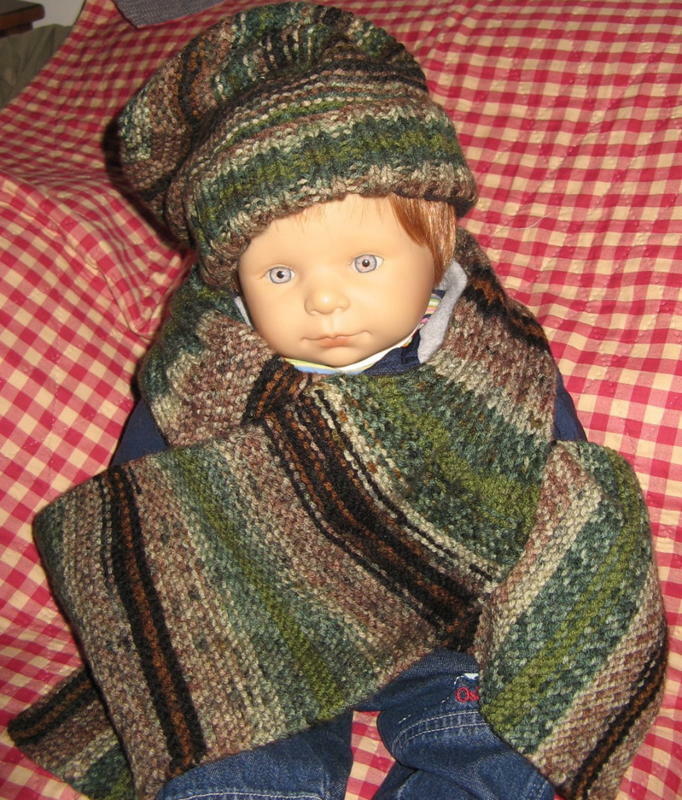 I am a 30 year knitter and am out of projects for the moment. I can start working for next year since the 2009 offerings are sent already. Welcome, Susan! Which I see you are already at home in the Gunroom, and I’ll add you to our informal, offlist emails.